Pad Thai while camping? It’s easier than you think! We made this recipe using just a standard camp stove and it was so simple and delicious! Up until now, our Pad Thai consumption had been limited to going to Thai restaurants. It was sort of a specialty dish we’d only get when we’re eating out. We’d never make it at home, and we’d definitely never think to make it at a campsite. But all that changed when we started going to a local Thai food truck for our Friday date night (StirFriday for any Archer fans out there!) Inside the food truck, crammed into a tiny kitchen with just two burners to work with, was this young lady who was whipping up all sorts of noodle dishes to order. There she was, making these incredible tasting Thai noodles with just two burners! “This could totally be a camping recipe,” we thought. 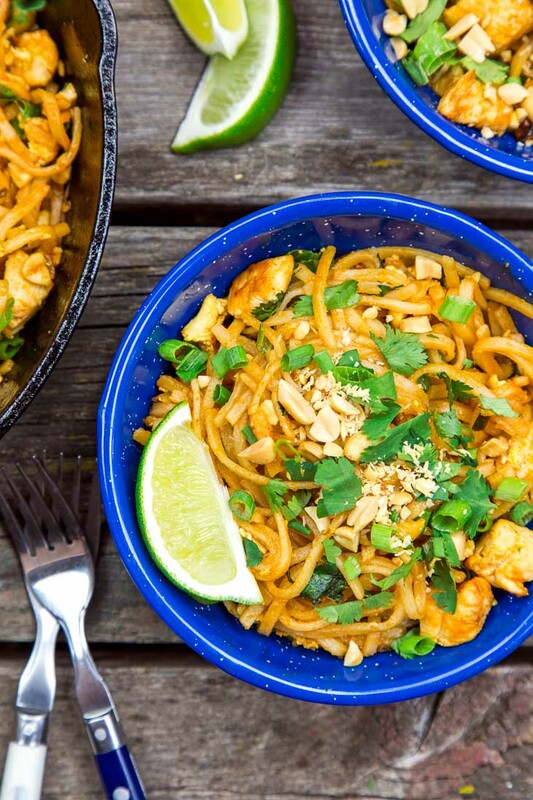 So we tried it out and came up with this camping-approved Chicken Pad Thai. Here are the main key concepts. The recipe can be made with either a one or two burner stove, but you will need a pot to cook the noodles and a pan large enough to hold all the chicken and the finished noodles. We used a cast iron skillet which worked alright, but it would have been better if it were a non-stick pan – particularly for the scrambled egg part. The first step is to bring the pot of water to a boil. Once you have a nice rolling boil, turn the heat off, and drop in your noodles (we used these). Try to keep the noodles together in a bundle when dropping them in (aka don’t scatter them all over the place). That will just sit there and cook over the next 8-10 minutes while you are cooking all the other ingredients. If you’re using a one burner stove, just take the pot off and set it to the side. If you’re using a double burner, move over to burner two and start heating your skillet. In a well-oiled skillet, you’ll cook the chicken and onions. Once they’re starting to look properly browned, turn the heat to low and push the chicken to one side. Then dump in your beaten eggs and scramble using a fork or spatula. Once the eggs begin to firm up, mix them together with the chicken. All of that should have taken about 8-10 minutes, so your noodles should be just about ready. So with a pair of tongs, lift the noodles out and place them in the skillet with the chicken. It’s fine if they’re still a little wet still as it will add to the sauce. With noodles, chicken, onions, and eggs combined, now is the time to add your Pad Thai sauce. If you want to make your own at home and bring it with you, we have a recipe below. But if you just want to pick up some from the store that’s fine too! Toss it all together, top with sliced green onions, cilantro, and peanuts. And that’s it! You’ve got a quick and easy Pad Thai that takes only about 15 minutes of active cooking. 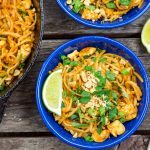 So if you want to try something different and spice up the menu for your next car camping trip, give this Pad Thai recipe a try! 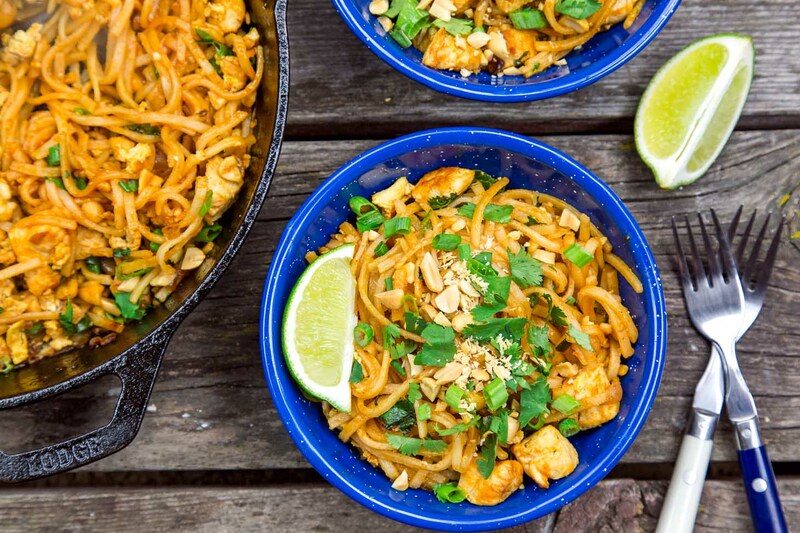 This chicken pad thai is easy to make on either a one or two-burner camping stove. Make the pad thai sauce at home before your trip, or use store-bought sauce to keep things simple! Meanwhile, heat 2 tablespoons sesame oil (or regular vegetable oil if that’s what you’ve got) in a skillet over medium. Once hot, add the chicken, onions, and salt. Saute until the chicken is cooked through and the onions are starting to brown. Move the chicken to one side of the pan, lower the heat, then add the eggs to the skillet, stirring them frequently to scramble. Once the noodles are done (see step 1), the chicken is cooked through, and the eggs are scrambled, use tongs to lift the noodles out of their soaking water. 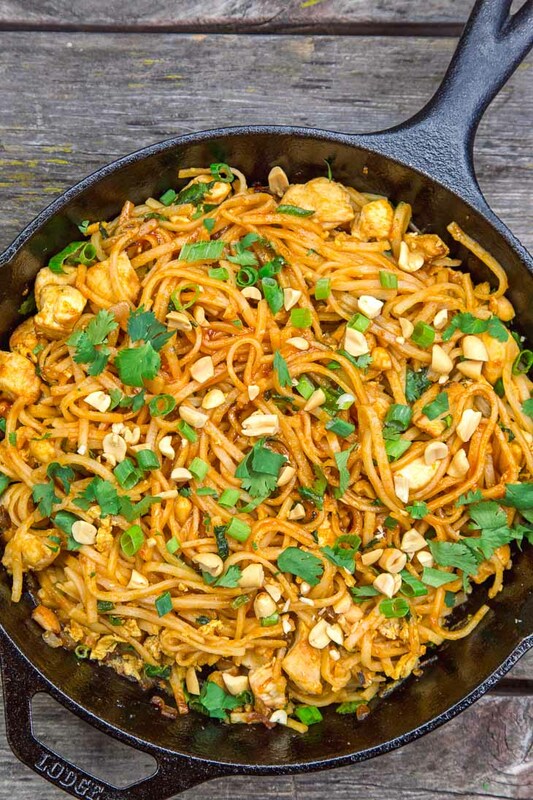 Add noodles to the skillet, then pour in the pad thai sauce. Stir to coat the noodles. Top with green onions, fresh cilantro, and chopped peanuts. Enjoy! Combine all the sauce ingredients in a small, sealable jar or bottle and shake to combine. Pack in your cooler. Is this an individual serving? Thanks for catching that – it’s 2 servings. Looks delicious! We are about to go camping and there’s a burn ban in effect, so this looks like a perfect camp stove recipe to try! What size skillet is used in the video? We often do corn on the cob in the fire (roasting them with the husks on) & I do an extra cob, then cut the kernels off that sweet summer corn into our camping pad thai. Yum! We generally use shelf stable tofu or canned chicken in our & save it for a night far into the trip, for a lovely dinner. A fun way to mix this up is to fill spring roll rounds with the pad Thai mixture. Wrap them up and eat whenever you need a snack.